My name is Austin Davison. I live in Park City, Utah, a town situated in the Wasatch Mountains. My love of the outdoors has kept me active and in strong physical condition year-round. Although I enjoy many sports and rigorous activities, baseball is my passion. I attend Rowland Hall prep school in Salt Lake City. Rowland Hall offers a rigorous academic regiment coupled with the opportunity for me to play four years of varsity baseball. My favorite subjects this year are AP Physics and AT PreCalc. I play on the school's basketball and baseball teams. I’ve discovered that basketball has been a boon to my conditioning routine which has really improved my base running. Jay Brossman, the University of Utah Assistant Coach plotted out a training roadmap for me. I meticulously execute the roadmap so that I may fulfill my goal to play college baseball. Coach Brossman not only devised my training plan while I attended his baseball clinic, he also shared some lasting words of advice. Coach told my group that our chances of playing in college would be small, but for any of us to have a chance to play in college or beyond, we would first have to become the best player on our team, then the best player in our region, the best player in our conference, then the best player in our state. Coach Brossman impressed upon me that it would take a lot of hard work to hit the milestones he outlined as well as to be able to hit a fast sinking curveball. Since I attend a prep school with a focus on academics, I have played on travel teams in the summer and fall with older players. My weekends and free time during the off-season are reserved for clinics at University of Utah, BYU and nearby baseball academies. As a Freshman in high school I lettered as a varsity baseball starter and was awarded a place on the 1st All-region team roster. In my Sophomore year, I earned my starting position once again. At the end of the high school season I led the state in all divisions in Batting Average, Slugging, RBIs, OBP and I was 3rd in stolen bases. I earned both All-region and All-State awards and was selected as one of the All-stars by coaches to this year's Utah High School All-Star game and was the only Sophomore. In the pre-game home run derby of the All-Star game I came in second out of 30 players with 10 hits over the fence. In the game, I went 2 for 3 at the plate (in a game with only 6 hits) and helped to lead the North team to a 4-1 victory. - Playing for the Salt Lake Gulls Baseball Club, a high-level independent summer team that participated in several tournaments including the Prospect Wire West Coast Invitational, GSL Invitational, Prospect Wire World Series and Connie Mack qualifiers. - Attending the Stanford University All-Star camp. - Playing in the 17U USA Baseball National Championship Tournament-East on Team Freedom, a free-agent team organized by USA Baseball. - Playing in Puerto Rico for Planet Baseball with other high school comp-ball players and organizing an equipment drive and clinic for underprivileged kids there. - I also played for the Judge Memorial Catholic High School Summer Varsity Team, whose head coach also coaches the Elite travel club the Utah Horns, that I was invited to be part of this fall and I am in fact playing for the team. We are participating in two Perfect Game tournaments and two tourneys in SoCal this fall. In addition to playing for the Horns and continuing to work out with the Gulls on skills building, I found this past summer really helpful in assessing where I am competitively. I am supplementing my baseball workouts with weight lifting and speed work 5 days a week. I have also tweaked my diet by adding extra protein, fiber and greens with the goal of adding 10-12 pounds of more muscle to improve my key stats 10% by the Spring season. It is my desire and what I am working towards to again lead the state in many key stats, but to knock 10 homers this season to show my power improvement. My interim goal before I head off to college is lofty but attainable in my mind. I would like to have my high school jersey number retired on graduation day. Only one student- athlete accomplished the same feat since my school was founded in 1867. I strive every day to be the second student-athlete to attain this honor. My deep desire to achieve excellence both academically and in baseball has taught me to manage my time well. I commute one hour each way to school, play sports year-round and attend a highly competitive prep school. I feel blessed that I have many supporters among my family, friends, teachers and coaches as I pursue my dream of playing baseball at a college that also offers challenges and rewards on the diamond and in the classroom. Spring Training in Mesquite, Nevada is one of the most popular baseball events in the West, hosting over 600 players annually for more than two decades. Staff: Representing more than a dozen states Instructors from Professional, College and High School baseball as well as the Major League Scouting Bureau and USA Baseball will be on-hand to get a look at one of the largest High School talent showcases in the country. The enormous popularity of this event has MountainWest baseball turning away 100 players a year. High School participants will receive a tremendous amount of exposure in front of many College Recruiters and Professional Scouts. Most importantly, Spring Training will remain our top identification event for: USA Baseball, Fall Classic and Perfect Game events and local, regional and national top player lists. At the conclusion of Spring Training, rosters or these seven National events along with our top player list will be announced. Playing on USA Baseball's invitation-only free agent team, Team Freedom. A “Showcase Morning” which includes offensive and defensive showcase, batting practice and objective measurements and three live games. Two Games AND Evaluations- Each player will participate in two games and pro-style workouts where all measurable will be recorded (60-yard dash, exit velocity, pop times, defensive showcase). Was offered a spot on one of three national teams. Evaluated in top 5% of all players nationally by BF. 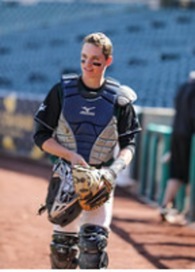 Coach referred Austin to Coach Dean Stotz, Stanford University All-stars camp for following summer.